There’s a new Farmer’s Market coming to Pasadena. Starting August 4, 2013 in Old Pasadena. It will be located on Holly between Fair Oaks and Raymond. Steve Mulheim and the business owners of the Old Pasadena Management District have been working hard for many months to make this new market a reality and have secured Southland Farmers’ Market to manage the market. 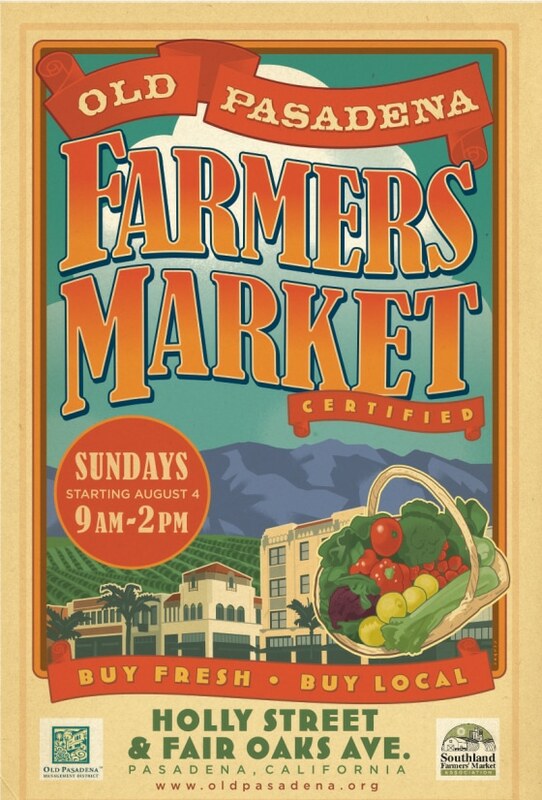 The Old Pasadena Farmers Market is coming Sunday, August 4th, 9AM-2PM on Holly Street! Unlike some markets, this market will be held year-round. We are excited to welcome this new market to Pasadena. Pasadena now has a variety of Farmers Markets to select from on different days. Saturdays: Victory Park – 8-1, get your fresh squeezed wheat grass, this is one the best markets in the area. Tuesdays: South Lake – we understand this market has closed. Wednesdays: Playhouse District on Union 3:30-7:30pm, be sure to check out the bread vendor. Southland is currently recruiting certified growers and vendors of artisanal products and healthy foods for the new, soon to be opened Old Pasadena Farmers’ Market. The Old Pasadena Farmers’ Market will be held on Sundays from 9:00 AM to 2:00 PM on East Holly Street between North Fair Oaks Avenue and North Raymond Ave. This is a lovely street in the upscale retail and restaurant district known as Old Town Pasadena. This market is also sponsored by the Old Pasadena Management District (www.oldpasadena.org) who is promoting the market to the community. The market will open on August 4, 2013 and operate year round. Stall fees are $40 per 10’ x 10’ stall space for certified producers and $60 per 10’ x 10 stall space for all other vendors. If you are a interested in participating in the Old Pasadena Farmers’ Market, complete one of the following applications and submit the requested documentation. You may email the completed application to [email protected] or mail it to SFMA, POB 858, Topanga, CA 90290. For more information, contact Howell at 310-455-0181.